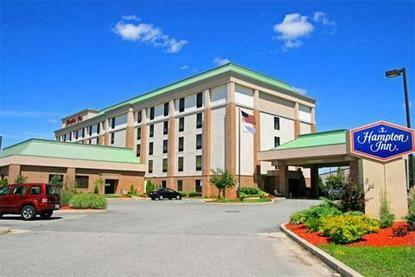 Hampton Inn Coventry is a five story hotel featuring 124 elegantly appointed guest rooms .Complimentary amenities include High Spead Internet access, local and 800 phone calls, in-room coffee, and deluxe breakfast bar . Located directly off I-95 at Exit 7.Centrally located in the state, just 9 miles south of TF Greene Airport, 13 miles south of Providence, 25 miles west of Newport, 20 miles north of the beautiful South County beaches and less than 35 miles east of Foxwoods and Mohegan Sun Casino's. Coventry is Rhode Island's largest and fastest growing town, with 65 square miles of picturesque land and 2.6 miles of inland water. Coventry is centrally located, making it an ideal choice for vacation and leisure travel. With destination and day trips within short distances such as, historic tours of Providence and Newport, numerous museums throughout Rhode Island and eastern Connecticut, shopping from Newport and Providence boutiques to the upscale Providence Place Mall and outlet shopping throughout the northern Rhode Island area. Whale watching excursions from Point Judith ferry to Block Island Roger Williams Park Zoo, which was rated one of the top 10 zoos in the US Yawgoo Valley Ski area and numerous colleges and universities. Within one-eighth mile, enjoy dining at Cracker Barrel, Applebee's, Denny's, and Wendy's as well as number of dining choices from the local casual offerings to the upscale dining experiences throughout the state of Rhode Island.